Clayton Hotel Leopardstown is located on the M50 and within easy reach of all the major road networks including, M1, N7, N11. The hotel boasts an underground car park and the Luas is only a one-minute walking distance from the hotel making it a fantastic destination for your trip to Leopardstown Racecourse. The hotel is also close to the RDS, which hosts the Dublin Horse Show. 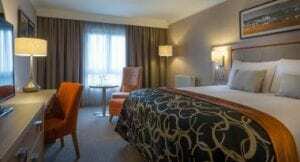 Staying in a Hotel near Leopardstown Racecourse? For an enjoyable stay close to Leopardstown Racecourse, Clayton Hotel Leopardstown is the ideal choice. We have 357 luxurious bedrooms with a choice available between superior and family rooms for family-friendly hotel breaks and junior suites. If you fancy an extra treat then upgrade to one of the executive rooms for added comfort. The executive rooms are finished to the highest standards and include a signature Clayton king bed, Nespresso machine, luxury toiletries, bottled water, mini-fridge, bathrobe, and slippers. On your return to the hotel after an exciting day at Leopardstown Racecourse enjoy a sumptuous meal in our Brasserie restaurant. If you’d rather a light snack or some pub grub, then try our bar. It’s a great place to unwind and relax after a busy day at the races or to watch some sports with a nice cold beer. If you are one of the many fashionistas at the Racecourse, you may want to have a cheeky cocktail before the main event. Join us at our new cocktail bar and enjoy a classic cocktail with your stylish friends. Make sure you don’t miss the Clayton Vitality breakfast buffet the following morning. Choose from a wide range of food options, including homemade porridge, Clayton granola, fresh fruit salads, and fresh pastries as well as a range of options at the hot counter. Why not check out our Leopardstown Races accommodation packages and book your next racing break? The racecourse holds many horse racing events each year including the following favourites. The Gold Cup takes place in February and is a real highlight of Irish horse racing. With seventeen jumps and the cream of the crop in racing horses, it is always a fun day out for a horse racing enthusiast! Take the kids for free to this family race day in May and enjoy a family day out full of horses, excitement and fun child-friendly activities. Check out our family rooms for a family weekend! In April, the legendary Spin Student Raceday takes places in Leopardstown. With free concerts, horse racing, a fashion competition and gas entertainment, it’s the biggest student event of the year. But be sure to book your tickets in advance as this event sells out very fast! The Longines Irish Champions Weekend in September celebrates everything that we love so much about the Leopardstown races: the very best of horse racing, fashion and music. If you are planning to attend this event, you’re in for a real treat. And don’t forget your hat, because you may be in for a chance to win the Champion Hat Competition. The highlight of the Irish Christmas holidays, the 4-day racing spectacular at the Leopardstown Racecourse takes place every year between Christmas and New Year’s Eve. Experience the excitement of the various hurdles and enjoy a post-Christmas drink or bite at the food hall or one of the many other on-site facilities. 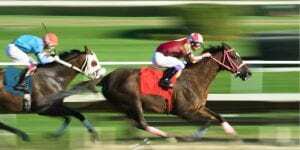 We, at Clayton Hotel Leopardstown, also offer a related Christmas hotel deal for horse racing enthusiasts. Read more about our Christmas Racing Hotel Package here. In the mood for racing and music on a hot summer night? Then the weekly Bulmers Live Festival at Leopardstown Racecourse may be exactly what you’re looking for! With a fabulous line-up of musicians and jockeys, it makes for a great night out. Don’t worry about getting back home, it’s only a short walk back to your room at the Clayton Hotel Leopardstown!